Speed does matter when it comes to internet browsing. Slow Internet connection can drive you crazy especially when you are urgently browsing for something but it takes you ages to load a page. Making changes to your Domain Name System (DNS) server settings is one of the ways to improve your internet browsing speed. Technically, DNS Server is a translator which translates domain names typed by users into the numerical identifiers, IP addresses, recognized by the machine and via versa. Hence, the faster the DNS server, the quicker the browser will respond. There are various Public DNS services which aim to assist users to speed up their browsing experience. For instance, Google has announced a free Google DNS service designed to speed up users’ browsing experience a couple of weeks ago. (Users who want to learn how to configure and use Google Public DNS can read our previous post via the link here). If you have tested Google Public DNS or other public DNS Services, but cannot decide or have doubts which one is the fastest and most secure, perhaps this tiny and free utility, Namebench, might give you some guideline and ideas. Developed by Thomas Stromberg, a Google engineer in Belgium, Namebench will do a quick search and locate the fastest DNS server for users once it is installed. The search test takes a few minutes and the result will be displayed in the web browser. For easy illustration and understanding, the results are summarized and presented in various charts and graphs. Users who want to give it a try to test their own ISP’s DNS servers and compare with OpenDNS, Google Public DNS, and other DNS servers can download it via the link here. This tiny application supports OS X, Windows, and Linux. 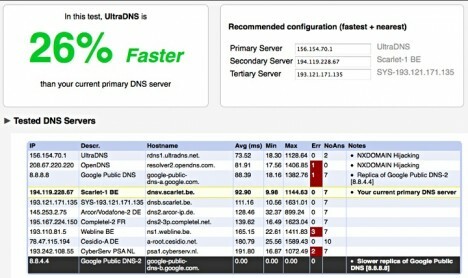 Another DNS benchmarking tool available is aptly named DNS Benchmark.